Build a stunning marquee sign for your wedding to decorate your reception. 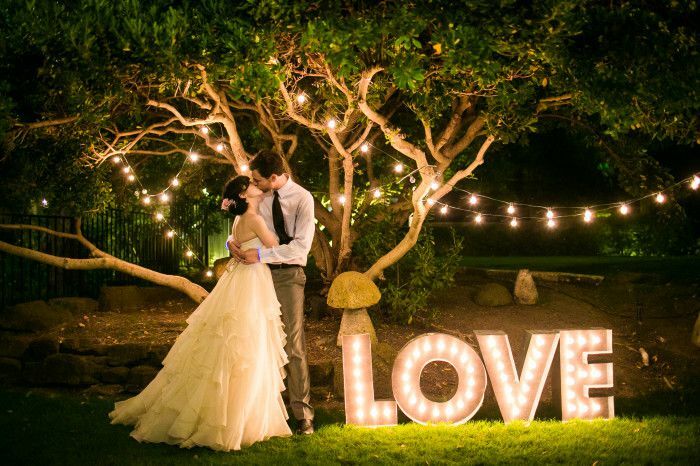 The beautifully light sign that spells love will make for the perfect backdrop for your wedding photos, and once the wedding is over, it can be used in your home as an accent light. DIY Wedding Marquee from Evan And Katelyn. Help cut wedding costs by making wedding bouquets for the bride and bridesmaids by the day of the wedding, that combine sweet smelling roses and elegant hydrangea blossoms to create professional looking bouquets. Do you dream of having a huge wedding cake for your wedding? If so, one way to save costs is to create a large tiered artificial cake for photographs while serving less expensive slab cake at the wedding reception. Announce your wedding stylishly with these handmade gold gilded save the dates which can be made by hand painting liquid gold lead around a piece of card stock. Set the stage for your dessert table by crafting a dramatic floral background that is made out of paper. This dreamy backdrop could easily be used as a photo backdrop for your wedding photos and later moved to behind your dessert table. Is your wedding reception and ceremony happening at two different locations? If so help your guests figure out where to go by posting signs to direct them where the ceremony and reception are taking place. Add some sparkle to your wedding dress by making a stunning rhinestone belt to tie around your waste. This super simple do it yourself project can be done in a few minutes using glue, ribbon and craft rhinestones. Save money on favors for your guests at your wedding by baking up adorable stacked cookies that look like a mini tiered wedding cake. Skip the traditional bride and groom plastic figures wedding cake topper and make your own classier cake topper by cutting out this intricate Mr. & Mrs. script that can be attached to two bamboo food sticks. If you are your significant other are having a destination wedding, or simply love to travel these do it yourself table signs are a cute way to share travel photos with your wedding guests. Instead of typically table numbers name each table after a city or country with a photo of the two of you in that location. Weddings can be difficult for young children as they need to sit down for long periods of time while remaining quite, so help keep them having fun by creating wedding themed activity book so they can color while the ceremony takes place. Label the bride or grooms chair, or the rooms designated for them to bride or groom to get ready in by hanging a DIY sign. To make your own set of bridge and groom signs download the template and attach a ribbon to the top of each sign to hang them from. Save money on envelopes by mailing out your own custom post card save the dates. Download the template for photo save the date postcard which you can customize with your photo and wedding details at the Wedding Chicks. Create table number tags that can go over a bottle of wine and act as a table number. This clever idea is affordable to make, using a small piece of card stock and lets guests be able to easily pour their own glasses of wine while they dine at your wedding reception. Keep your guests entertained at your wedding reception by having a guest book where guests are invited to write down advice for the newly married couple. After the wedding, or even years later on your anniversary these advice cards that double as a guest book will be a cherished memory of your big day. Adorn your ceremony aisle with rose petals with this beautiful DIY that uses artificial rose petals adhered to a pattern that you can roll out on to the aisle on the day of your wedding. Invite your dearest friends to be your bridesmaids for your wedding by mailing these chic DIY cards. After your wedding make sure to take the time to thank all your guests for attending your wedding. This cute heart themed printable save the date card is sure to get your invited guests excited about your upcoming wedding. If you are looking for a modern way to decorate your wedding cake without spending much money this do it yourself cake topper is perfect. Customize the wooden letters to match your wedding colors, and spell out your choice of message which can be attached to bamboo sticks.